Using the latest Information Technology, we provide rapid, economical and fail-safe administration, accounting and payment procedures to our valued clients. Van's Auctioneers has over 50 years' experience in the auctioneering industry. We’re known for our efficiency, professionalism and enthusiasm. With our dynamic background, motivated leadership, and dedicated staff, we look forward to continued service to our clients. 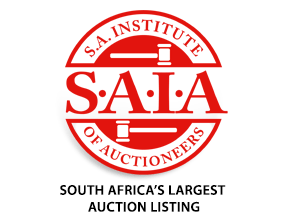 Van's Auctioneers is a member of the SA Institute of Auctioneers (SAIA) as well as the Estate Agency Affairs Board (EAAB). We do not charge a fee and we only earn commission when a sale is concluded. The buyer is liable for the payment of auctioneer's commission. The seller will, however, be liable for the advertising costs as per the approved budget and schedule. We currently have over 13,300 potential buyers registered on our database, SMS and e-mail notifications are sent on a daily basis reaching an average of 7,000 notifications per week. Our website is one of our most powerful marketing tools, containing extensive information on upcoming auctions and auction procedures. Our website also includes a virtual tour facility which allows web-visitors to view properties online. We also promote our auctions through Facebook and Twitter. Our high-quality media advertisements provide us with good coverage for local markets as well as high geographic and demographic selectivity. Auction boards and/or billboards are strategically placed in and around specific areas to reach targeted audiences, providing maximum exposure. We compile an auction brochure that is handed out on the day of the auction containing important information regarding the sale of the property as well as photos, maps, zoning certification and the conditions of sale. All private sales are subject to acceptance by the seller and not "at the fall of the hammer". By explanation, we will not sell the property/assets at any price achieved at an auction. The sale is subject to acceptance by the seller. Should you not want to proceed to auction directly, our dedicated full time agents can market your property for a period of time and the property can be sold "out of hand". Upon receipt of a detailed property description, we will conduct a deed search, providing us with comparative sales in the area as well as additional property information. We would then contact you and set up an appointment to inspect and photograph the property allowing us to compile an auction proposal containing the advertising budget, draft media advertisement, conditions of sale, etc. We then also establish whether the price you are looking for is obtainable in the current market and advise you in this regard. We supply you with the auction proposal and exclusive mandate which needs to be completed, signed and returned with a proof of payment for the advertising costs as set out in the auction proposal after which we then proceed to auction. Contact our specialists if you have any questions.